“Disqualify him, defeat him, unite the party later.” On Wednesday, that was how CNN characterized the Clinton campaign’s plan to contain an ascendant Bernie Sanders. Shortly after the insurgent senator’s 14-point win in Wisconsin, the Clinton camp sent out a fund-raising email that suggested Sanders’s widely criticized interview with the New York Daily News showed that he isn’t qualified for the presidency. 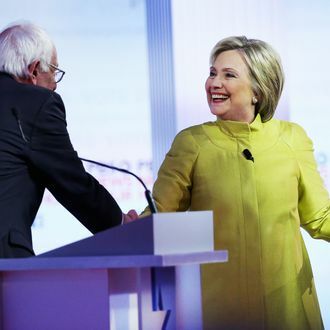 For weeks, Hillary Clinton had largely ignored Sanders, reserving most of her fire for the GOP front-runner. But Clinton went on the offensive Wednesday, questioning the democratic socialist’s party loyalty and the depth of his policy knowledge, accusing him of putting gun manufacturers’ interests before those of the victims at Sandy Hook, and then refusing to say whether she believes he’s qualified for the presidency when asked by MSNBC’s Joe Scarborough. That little snub spurred the Washington Post headline “Clinton questions whether Sanders is qualified to be president.” And that headline got Bernie Sanders’s blood boiling. “She has been saying lately that she thinks that I am, quote unquote, not qualified to be president,” Sanders said, inaccurately, at a rally in Philadelphia Wednesday night. “Well, let me just say, in response to Secretary Clinton: I don’t think you are qualified if you get $15 million from Wall Street through your super PAC.” Sanders proceeded through a litany of other disqualifying elements in Clinton’s record, including her Iraq War vote and support for a unilateral trade deal with Panama. For most of its duration, this year’s Democratic primary has been far tamer than the contest between Clinton and Obama in 2008. At one point in that earlier race, Clinton strongly implied that the ultimate Republican nominee, John McCain, was more qualified for the presidency than her Democratic rival. But by actually uttering the words “I don’t think you’re qualified,” Sanders stumbled across a political redline: In a partisan primary, you’re supposed to leave yourself cover for an eventual endorsement; describing your opponent as unfit for the presidency severely undermines that cover, while tossing the other side a delicious sound bite. What’s more, while Clinton’s critique of Obama was grounded in skepticism about his experience, Sanders’s charge is that Clinton’s ideological commitments disqualify her from holding office. That line of attack could prove dangerously potent, hampering Sanders’s ability to persuade his most ideological backers to unite behind Clinton, should she clinch the nod. Sanders’s remarks sparked an understandable backlash. But on Thursday, the Democratic front-runner appeared to have adopted a new strategy: Mollify him, unify the party, and defeat him later. Clinton’s decision to deescalate may mean that her campaign feels their brief offensive has already paid off. Sanders’s brand for much of this campaign has been built on his issue-oriented, attack-averse style. Perhaps the goal of Clinton’s sharp critiques was to inspire an outburst of negativity like the one Sanders unleashed on Wednesday night. Alternatively, Clinton may have recognized that the costs of a nastier primary fight far outweigh its benefits. At this point, Sanders will need a miraculous surge to overtake Clinton’s lead among pledged delegates. And even if he does, because so many of his wins were earned at low-turnout caucuses, Clinton will still likely be able to claim a majority in the race’s popular vote, which could very well be enough to keep the party’s superdelegates in her corner. For Clinton, the risk of losing the nomination at this point is minuscule; the risk of losing Sanders’s most committed supporters in November appears to be growing. On Thursday in Philadelphia, Sanders doubled-down on his remarks. Citing Wednesday’s CNN’s report and the Washington Post’s headline, the Vermont senator argued that, although “this is not the type of politics that I want to get in,” his campaign will always “fight back” if attacked. “If Secretary Clinton thinks that just because I’m from a small state in Vermont and we’re gonna come here to New York and go to Pennsylvania and they’re gonna beat us up and they’re gonna go after us in some kind of really uncalled for way, that we’re not gonna fight back, well we got another — you know, they can, guess again, because that’s not the case,” Sanders said, sounding a bit like the star of an action movie who has forgotten half the lines in his big monologue. Sanders then reiterated his many qualms with Clinton’s record on trade, war, and Wall Street, before saying that he nonetheless respects the former secretary of State and hopes they can return to the important issues facing the country. Judging by Clinton’s remarks in the Bronx, they can.